Origin and Habitat: Viscaino desert on rocky sites between El Crucero and Cerro Juan to the Laguna Seca Chapala and east to Las Arrastras and Calamajue Misión de Arriola. Habitat: Grows on volcanic blocks, weathered granite and greenish slate. 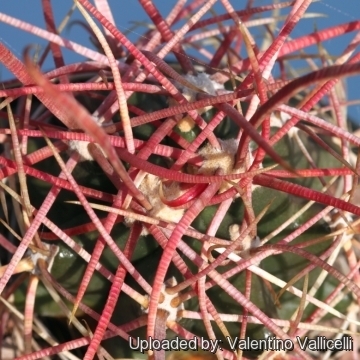 Description: Ferocactus cylindraceus var. tortulispinus along with Ferocactus lecontei, and Ferocactus rostii is one of the old controversial geographical forms of the variable Ferocactus cylindraceus = (Ferocactus acanthodes). 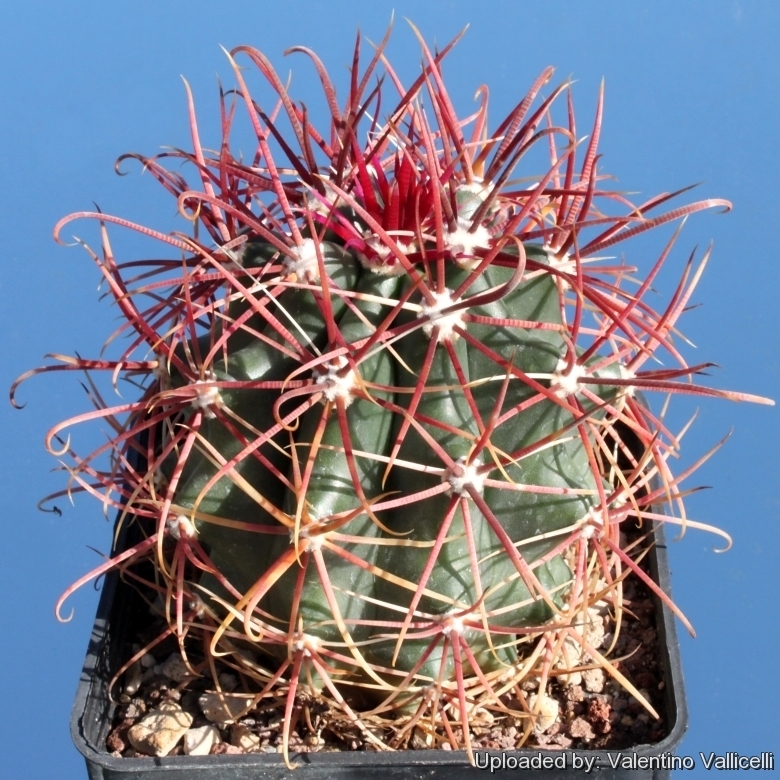 It differs from the very similar Ferocactus lecontei for the thicker and shorter body (not over 60 cm tall) and for the long dull gray to reddish spines, with the lower central spine that is often twisted and distorted. 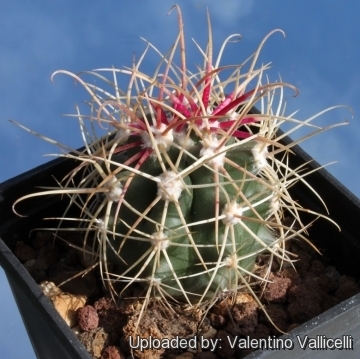 These features are not always constant and it is probably only a form of the extremely variable Ferocactus cylindraceous. 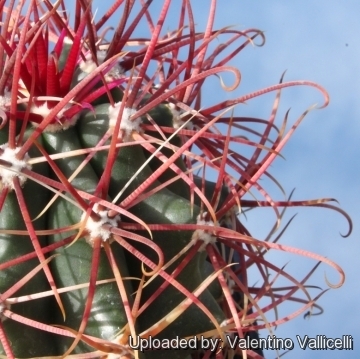 In a single population of Ferocactus cylindraceous, you can find all forms of plants with different number, shape and length of spines. It can happen that two individuals of two different populations can look very similar and also, two plants of the same population can look very different. Cultivation and Propagation: It is a summer-growing and pretty easy plant thought slow to start. 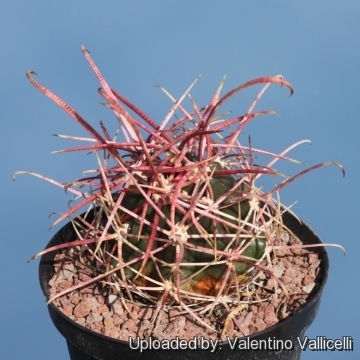 It makes great potted specimens, and is a great cactus for beginning collectors. Growth rate: It is a slow growing species. Plant in good conditions will start to bloom when reach the diameter of only 15-18 cm. Soil: It grows well in a rich, well drained soil such us clay, pumice, lava grit, and only a little peat or leaf-mould, but it isn't picky about soil. Hardiness: When dormant, the plant is very cold tolerant (down to nearly -5° C or less), but when left out it is more sensitive to frost. During the summer it is best to keep the plants outside where the temperature can rise to over 30 C with no harm to the plant. This plants need a period of cool rest in winter to produce flowers abundantly. Exposure: They do need a lot of light to develop their typical spination, but different clones vary in their tolerance of full sunshine. However some protection in light shade is recommended during the hottest hours in summer. It can tolerate moderate shade, and a plant that has been growing in shade should be slowly hardened off before placing it in full sun as the plant will be severely scorched if moved too suddenly from shade into sun. If kept too dark they may become overly lush and greener and could be prone to rotting due to over watering. Propagation: Seeds are the only way of reproducing, remembering that seedlings dislike strong light and dry conditions and need to be repotted frequently. Seed Collecting: Permit fruit to ripen. Fruit must be significantly overripe before harvesting seed; clean and dry seeds.